Once in a while, we love eating sweet delicacies, shortcakes and anything else that belongs to this coated category. Before eating, we’ve probably named ten to a hundred reasons why we shouldn’t eat it. It was delicious, wasn’t it? Chances were you savored every millisecond of it. From looking at it with pried eyes to inhaling its scent before eating the very first bite. Everything was worth the taste and the feel of it on your tongue. But which feeling do you get after feasting on such a short-term-tummy-filling-oh so sweet dessert? Guilt or wait no, you try to convince yourself that it was your decision and that you should take responsibility for it. Right? What I’d like to do, after deciding to exercise and eat healthily. I’d like to drink tea and not any tea but Goalpara tea. 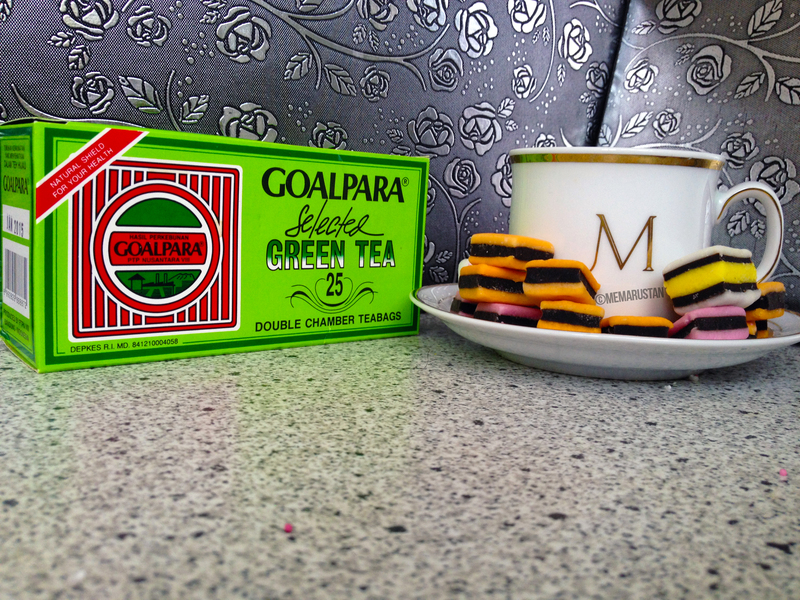 Goalpara tea has been in the business for 25 years. Yes, for 25 years they have been selling this little green secret box that has been helping many people for their weight loss purposes, etc. Here at my house, we have been drinking this tea for over 6 years. We absolutely like it, and it is the first drink we grab after enjoying our dessert. It removes the kind of cloggy sugary taste that remains in your throat. It is definitely not THE way to lose weight, but if you’d drink it every day for a week or two, you would see some results. Green tea always has had its health benefits which some of them are very visible in everyday life. This tea is made from unoxidized leaves and is one of the less processed types of tea (with white tea the least) and therefore has one of the most antioxidants. For more info on green tea check out this website. Bitter if brewed longer than 1.5 minutes and please do not add sugar. Whenever I drink my tea, I usually do not put any sugar in it. I liked to drink it pure and in its natural state. I think that this is the same when drinking tea with so many benefits. And coming to think of it, why would you drink tea with so many health benefits with sugar? I’m not saying sugar is bad but why. I can’t seem to think of reason, but if you do, please voice your opinion in the comment box. It has a natural smell and is in the least uncommon, but this could be because I’m pretty used to its smell that it doesn’t smell. It certainly doesn’t smell herbally or fruity tea like Lady Grey. As you can see in the photo above it has a slightly dark color to it which is the result of brewing it too long. If you brew it for 1.5 minutes, it will have its normal color which is light brown.